Just pottering around on a beach or sorting through a pile of gravel, you can be the first person to discover something that has not been seen for millions of years! Fossils provide an insight into the plants and animals that lived millions of years ago. 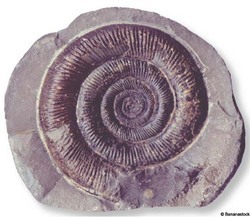 All fossils were once living things that have died and have been naturally preserved in rocks from the earth’s crust. Usually, only the hard parts remain while the soft parts rot away before they have time to fossilise. This is why fossils consist mostly of the skeletons and shells of animals or the leaves and woody parts of plants. Many of the smaller fossils that we find were once sea creatures that died and sank to the bottom of the sea. On the seabed, they became buried in layers of silt and the soft parts of their bodies would have rotted and disintegrated fairly quickly. As the layers of sand and silt built up, they became more and more compressed, gradually turning into sedimentary rock. The harder parts of the sea creatures such as shells or bones began to dissolve and were replaced by minerals from the surrounding rock. Over millions of years, the seas dried up, earth movements caused rock strata to fold and rise from the old seabeds, the rocks were weathered and eroded and the hidden fossils, now being made from a much harder material, were once more exposed.